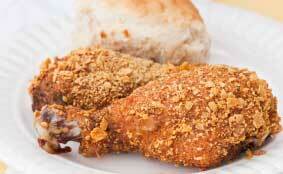 Moisten chicken with water, Shake moistened chicken 1 to 2 pieces at a time in shaker bag with coating mixture. discard any remaining mixture (can go in green bin) and bag. Alternate cooking – pressure cook naked chicken drumsticks in pressure cooker (in water not oil) for 15 minutes; drain & coat; bake on stoneware 400°F for 10 – 15 min or until done. Cornflake crumbs – can either crush the cornflakes cereal, or purchase the crumbs from the store, (found by the breadcrumb isle). So if you’ve got the kfc meal munchies, this’ll usually do the trick. Thaw fish in the plastic in cold water (not warm, not hot) – this is how we did the shrimp in the restaurant. Press the fish firmly into the coating & flip, repeat, do the sides as well. Put whole oven-safe frying pan in the oven – bake for 5 – 7 min ~ JUST till fish goes white, not clear in centre) don’t overcook or it will get that fishy taste and smell. special fish notes – if you’re good at keeping an eye on it, if you want to “finish” it in the frying pan instead of turning the oven on, sear til slightly crispy, turn the heat down to med-low and keep flipping it so the coating doesn’t get overcooked on either side.